Parents are sometimes startled when their children develop frequent nightmares. True, we all remember hiding from the monster in the closet or under the bed, but surely your child has nothing to be afraid of, right? After all, you have given him or her a loving, safe environment to grow up in. Nightmares are common among children of all ages, though. Remember, childhood is a time where anything seems possible, whether good or bad. So children’s nightmares can be quite terrifying. How can you help your kids cope with nightmares and sleep more soundly through the night? Here are some suggestions. 1. Do not invalidate your child’s fears. Resist the urge to say, “It’s just a dream.” It is just a dream, but something in it terrifies your child, and the fear itself is real. Remind your child that the dream is not real, but if you can, ask questions about the fear. If you show that you respect your child’s emotions and want to understand, that in itself can be reassuring. And if you can grow to understand the fears, you can help soothe them. 2. Give children tips to help them gain control of their dreams. You might think your six-year-old child is too young to figure out how to lucid dream, but that is not necessarily the case. Lots of kids grow up lucid dreaming from a very young age. Sometimes simply hinting to your child that it is possible to control his or her actions in a dream is enough to nudge the brain into making it possible. There are other useful suggestions too. For example, maintaining a dream journal can help a child develop memory and control in dreams. Another trick, is for your child to imagine a different (happy) ending to a nightmare on waking. Over time, this can help retrain the mind. 3. Instill confidence throughout the day. Your child might have nightmares about running away from a scary monster. But sometimes dreams are not literal. Maybe your child is always late finishing his or her chores, and you provide negative feedback. So really, your child is running away from those chores and that sense of failure. Ultimately, the dreams may have nothing to do with monsters, and everything to do with a lack of confidence and self-esteem. If you can find a way to help your child get back on track with the chores and provide more positive feedback, the nightmares might go away on their own. 4. Make sure your child has good sleep hygiene. Make sure your kid is in an environment which is conducive to sleep. If it is too loud or quiet, white noise might help. Some children like nightlights, while others do not. Do what you can to make the environment feel cozy, safe and comfortable. 5. Read your child a funny, enjoyable bedtime story. One theory that has surfaced , is that children have nightmares because they saw or heard something scary before bedtime. A relaxing nighttime routine can go a long way toward helping a child settle in comfortably for the night. And there is no better way to help a child relax and drift off to happy dreams than by reading him or her a bedtime story! 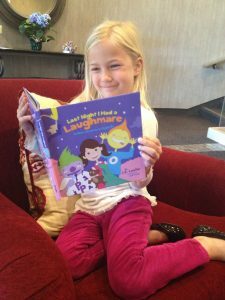 I have written a whimsical, fun book especially for this purpose called Last Night I Had a Laughmare. Great news, moms everywhere have now been telling us, their children have been waking up with “laughmares” instead of “nightmares”after reading our book.. Watching your child struggle with nightmares can be heartwrenching as a parent, but there is a lot you can do to help make bedtime feel fun, snuggly and safe again. Give these ideas a try, and see what happens.